This is a rectangular-shaped crab with a carapace twice as wide as it is long. It is flatter than its relation the Seagrass Sentinel Crab, Macropthalmus crassipes. This crab has very tall eyestalks, which when lying down in their channels, occupy the full width of the carapace front. In some specimens, the eyestalks extend beyond the edges of the carapace. The limbs have a fringe of hairs along their outer edges. The claws of the male are much larger than the female. To distinguish the Mudflat Sentinel Crab from the Seagrass Sentinel Crab look for a bump on the moveable upper finger, instead of on the lower fixed finger, as in M. crassipes. Carapace greenish-grey with light brown coloured limbs. 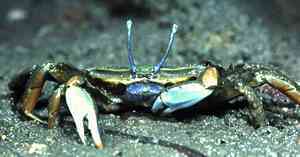 The chelae and eyestalks have a bluish-grey tinge. This Mudflat Sentinel Crab ranges from Cape York, northern Queensland down the east coast of Australia to Sydney, New South Wales. It is usually seen feeding at low tide on most estuarine muddy shores along its distribution range. It is a very common crab. It will lie partly buried in sloppy mud in shallow pools, with only its long eyestalks appearing above the water surface. Interestingly, it appears to only stick up one eye at a time. This might be a safety behaviour concerning predators. Why might this be so? I had great difficulty in taking a photograph of a crab with both eye sticking up. This crab just didn't want to stick two eyes up at the same time. It was very stubborn. Davey, K. (1998) A Photographic Guide to Seashore Life of Australia. p.62, New Holland, Sydney. Edgar, G.J. (1997) Australian Marine Life: the plants and animals of temperate waters. , Reed Books, Kew. Jones, D. & Morgan, G. (1994). A field guide to Crustaceans of Australian Waters. Reed, Sydney.